More Than Paper Blog: Personalized Easter Goodies! Before you head out to shop for your eggs (either to hide or decorate!) or run off to gather goodies for the kids' Easter baskets, check out what More Than Paper has for Easter. We have notecards, address labels, gift stickers, decorative stickers to make a quick greeting card, brunch and egg hunt invitations, placemats, plates and more tableware! Here is a small sampling of some of our favorite Easter products. Love these products like we do? Find them at More Than Paper, from top to bottom, left to right. 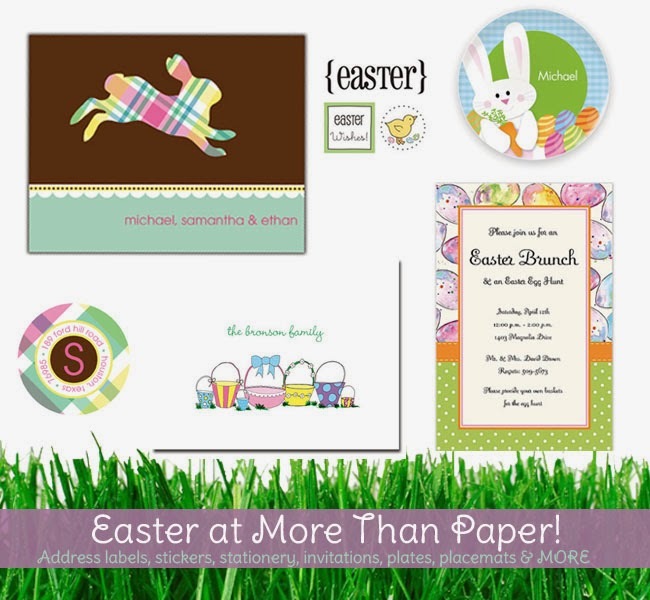 1) Foldover note card by Prints Charming 2) SRM Quick card stickers 3) Bunny Rabbit Plate by Spark and Spark 4) Address labels by Prints Charming 5) Easter baskets notecard by Robin Maguire 6) Easter Brunch invitation by Inviting Co. If you celebrate this holiday, what are your plans? What are your family traditions? We'd love to hear what you and your family are doing to celebrate either here on our blog or on our Facebook page! Stay tuned this month for great recipes, crafts and other traditions for Easter and Passover!